DoubleUps for Beds can custom manufacture a perfect linen to fit any size or type of mattress. Mattresses today run 8-24" (20 cm-61 cm). Our corner pockets are custom cut to fit the thinnest or thickest mattresses. DoubleUps for Beds uses only the finest first quality material for luxurious sleeping comfort. Our unique double reinforced construction creates a strong corner seam where mattresses need extra strength and durability. Sheets made for conventional mattresses will not fit today's thicker premium mattresses. DoubleUps for Beds uses high quality 1/2" (1.27 cm) elastic, double stitched and sewn all the way around the fitted bottom sheet. (Other fitted sheets on the market use 1/4" (.64 cm) elastic only in the corners.) Using 1/2" (1.27 cm) elastic all the way around the fitted bottom sheet creates a perfect fit for ultra-thick mattress depths. DoubleUps for Beds high contour deep pocket sheets are "guaranteed to fit" your premium mattress. DoubleUps Sheet On Today's Extra Deep High Contour Mattress. 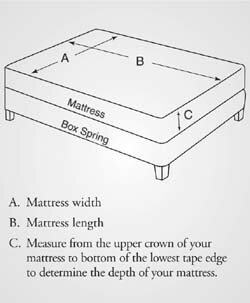 To determine the size (drop) required for your premium mattress you need to measure from the lowest tape edge of your mattress to the center of the upper crown, as shown on the illustration.